Knoxville Civic Auditorium and Coliseum opened its doors in 1961. The coliseum has a capacity of 6,500 and the auditorium seats 2,500. CIP was recently hired to handle the abrasive blasting of lead paint and the commercial painting of this project in Knoxville, TN. After all these years, the paint on the ceiling was starting to peel. In many cases, this would be a simple job, but in this case, the paint contained lead. Peeling lead-based paint presents a definite health hazard. So the paint had to be removed. And the ceiling had to be repainted. Working with a licensed and trained industrial and commercial lead paint removal expert is imperative on a job like this one. CIP received the award for our bid on this project. We removed the peeling paint from the structural steel and Tectum panels in the ceiling by abrasive blasting. Then we applied fresh coatings. It was important to contain the entire arena during the process of the lead paint removal. This consisted of tarping off the arena floor from the ceiling including the seating area. CIP utilized a crew of eight to ten experienced blasters and painters to safely secure the containment area. 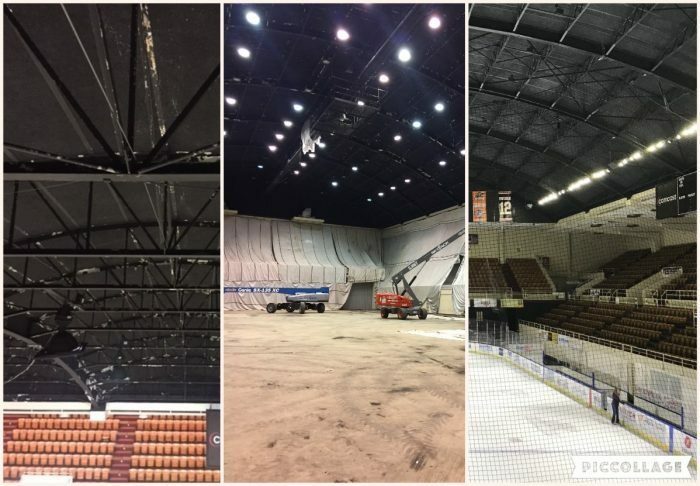 This project had to finish before the start of the IceBears hockey season. By working closely with the general contractor, the Christman Company, CIP was able to stay on schedule throughout the project. CIP successfully completed the project on time without any accidents or injuries. CIP met all EPA and OSHA requirements to protect the public and CIP employees by utilizing containment, decontamination trailer, and dust collectors. If you have a project requiring abrasive blasting, containment and lead-based paint removal in a commercial or industrial space, contact CIP to discuss your needs. Give us a call at 615-790-8822 to discuss your abrasive blasting and lead paint removal or click here to request a quote on your next project. CIP is a premier Nashville commercial painting contractor and one of the leading industrial sandblasting and painting companies in the southeast.